Simplicity makes a great lawn tractor! Considered to be in the middle to upper range in features and price, the Simplcity lawn tractors will be the envy of the neighbors anywhere they are found. Several models are available to help cater to differing budgets and consumer needs. All the Simplicity lawn tractors feature the “Quick-Hitch”. deck removal system for removing the cutting deck. This is a very innovative design, and must be seen to be fully appreciated. Taking the deck off to allow access to the cutting blades underneath is a snap with this system. The deck cutting height is easily adjusted manually using a hand crank, which appears easier to use than the traditional hand lever. The front axles on all Simplicity tractors is fabricated of cast iron. This is the sturdiest material available for a lawn tractor front axle. The deck design on the Simplicity lawn tractors feature the ‘step through’ design. This eliminates any obstructions in front of the drivers seat. This allows for easy entry and exit from the tractor without the need to lift feet and legs over a raised portion of the frame. Simplicity lawn tractors are available in 2 model series - the Regent and the more upscale Broadmoor. The Broadmoor models are more expensive, and are equipped with larger engines and heavy duty transmissions. There are five Regent models available, and three models in the Broadmoor series. The Regent series provide a choice between a single cylinder Kohler Courage engine, or a Briggs and Stratton twin cylinder engine. Horsepower ranges from 18 HP ( single cylinder) to 24 HP (twin cylinder). Both versions of the engine feature a pressurized oil system, with a replaceable oil filter. All of the Simplicity models feature an electric PTO used to engage the cutting blades. The decks feature either a a 2 blade cutting deck (38 “ width) or a 3 blade deck ( 44” and 50” width). Cutting height is adjusted by a hand crank, for very fine height adjustments. All cutting decks have ear rollers, which give a stylish striping effect to the lawn as it is mowed. This is commonly seen on professional baseball fields, for example. Count on spending between $2250.00 to $3250.00 for the tractors in the Regent series. The three higher priced Broadmoor machines built by Simplicity include models 18/38, 20/44, and 20/50. The 18/38 is equipped with an 18 HP Briggs and Stratton OHV (overhead valve) engine. The mower deck lays a 38” swath. A heavy duty hydrostatic transmission comes standard on the Broadmoor lawn tractors. The 20/44 has the more powerful 20 HP Briggs and Stratton OHV valve engine. The 20/50 carries the same 20 HP Briggs engine, which powers a wide 50” cutting deck. The two most expensive Broadmoor tractors come with a 3 blade cutting deck, activated by an electric PTO. Count on spending between $4300.00 to $4950.00 for the tractors in the Broadmoor series. 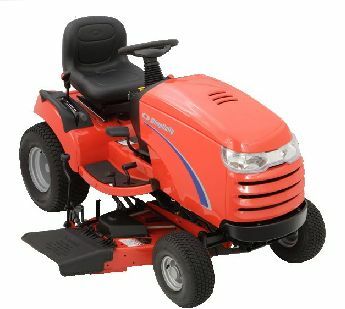 Most customers that purchase a Simplicity lawn tractor buy another in the future, based on high satisfaction.